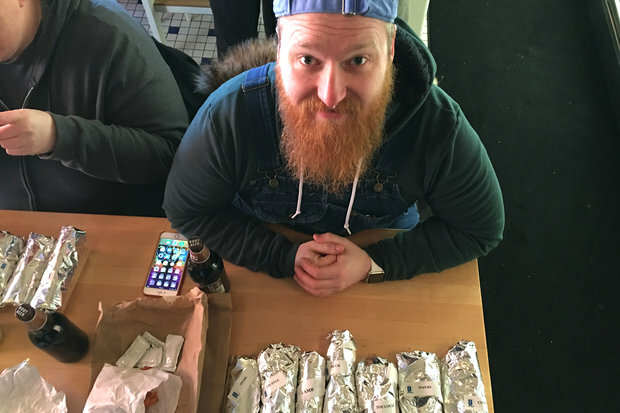 Meet The Guy Who Got in Line for Hot Doug's Pop-Up at 6 A.M.
Rogers Park resident Dave Burke was the first in line for Hot Doug's pop-up at Publican Quality Meats in the West Loop at 6 a.m. Monday. FULTON MARKET — Single-digit temperatures. Four-hour waits. Work. For those that really love Hot Doug's, there's not a whole lot that will stand in there way when Doug Sohn's famed sausages are on the menu. 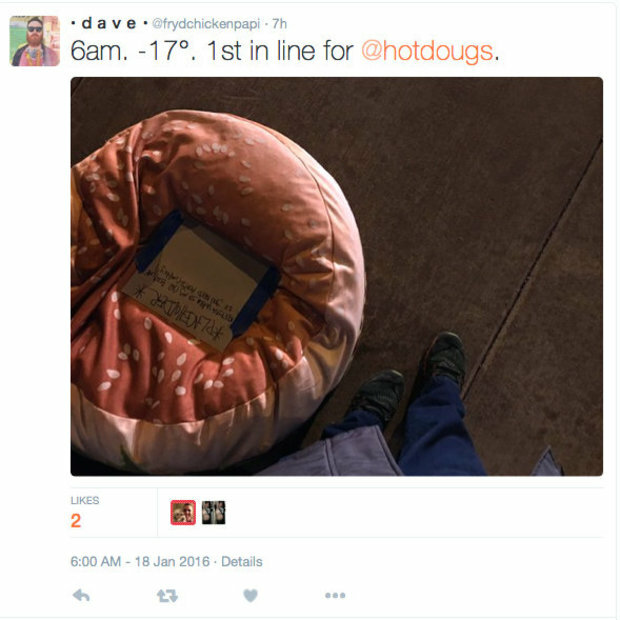 Dave Burke, a Rogers Park resident who works in computer retail, claimed his first-in-line spot with a hamburger bean bag chair at 6 a.m. Monday. By 8 a.m., he was waiting outside with others in single-digit temperatures — two hours before the Hot Doug's pop-up at Publican Quality Meats would open. "I wasn't going to stand outside in the cold without the sun up. I'm not climbing Mt. Everest," said Burke, 29. Instead, he watched his spot in line from his nearby car, watching YouTube videos to pass the time. Burke was supposed to work Monday, but ended up switching shifts with a co-worker. This was the first time Burke's company was offering time-and-a-half to work the Martin Luther King Jr. holiday. "I swapped out to spend more money," Burke laughed. "I miss Doug." While Burke may have waited four hours for his Hot Doug's fix, lines for most were much more reasonable. 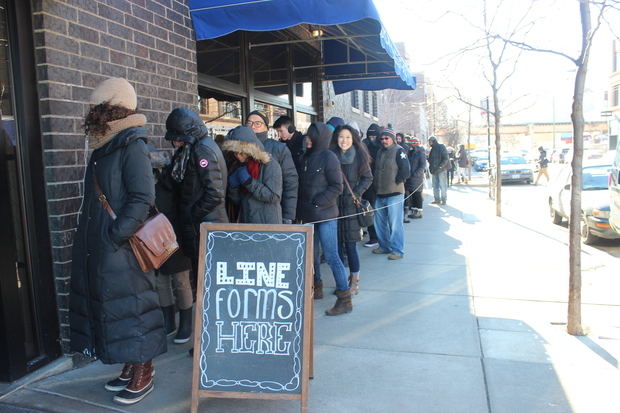 Customers in line at 10 a.m. for the Hot Doug's pop-up waited about an hour in the cold before ordering their sausage of choice. Later, lines were shorter. Burke is among a group of Hot Doug's fans who has a Hot Doug's tattoo that entitled devotees to free Hot Doug's for life before the establishment closed; his is on the back of his arm, hidden beneath warm layers Monday. "I got it a couple of months before he closed," Burke said. "It's honestly just because I love that whole experience and the food. Doug was always extremely warm toward me, he's a good person, he's a good friend." In the last week of Hot Doug's, Burke said he stood in the long hot dog line five times. By 11:30 a.m. Monday, Sohn shook hands with about a half-dozen old customers and friends who had Hot Doug's tattoos Monday. He plans to stay at the restaurant, at 825 W. Fulton Market in the West Loop, until they close up shop at 6 p.m.
"It's been definitely a lot of familiar faces, but also people who never got to the restaurant [before it closed]," Sohn said inside Publican Quality Meats. "The one things I miss is the conversations that I had at the counter and seeing people keep coming back. There's not greater feeling." On Monday, Burke nabbed all seven sausage varieties and Sohn's duck fat fries on the pop up menu. His favorites were the Bic Marcos, an apple bacon sage duck sausage, and the Chint Ross, an escargot and guanciale sausage. All were served on the same Chicago-made S. Rosen's buns Sohn served his dogs on at Hot Doug's. "I got to taste everything," he said. What makes someone so devoted to a now-defunct restaurant that they want to bear the brand's tattoo for life? It's something that meant far more than free sausage, Burke said. "Outside of the incredible quality [of the food], the other half of that was the experience to me, waiting in line, walking up to the counter, and still with a line outside he would still slow down and actually give you 3-4 minutes of his time," he said. "He remembered [stories] I told him about my mother. He took his time." In between greeting customers at Publican Quality Meats Monday, Sohn said he's still figuring out what comes next. "I'm trying to figure that out now. Something, but I don't know what," Sohn said. Could another restaurant be in Sohn's future, perhaps a second coming of Hot Doug's? The answer, unfortunately for Chicago's encased meat lovers, is still no. "Oh God, no. I know what's not next, and that's a restaurant," Sohn said. Known for hours-long lines and it's namesake proprietor, Hot Doug's, at 3324 N. California Ave., closed in October 2014. Last January, hot dog spin-off Frank Meats Patty opened in Hot Doug's Avondale storefront. But in December, the restaurant closed. Since closing, Sohn has opened a Hot Doug's-themed concession stand at Wrigley Field, created his own Atomic Pizza with Piece Brewery for a good cause, and was honored with the "The Doug Sohn," a Chicago-style hot dog/fried chicken sandwich, at Honey Butter Fried Chicken.